Yes! Now do you see why this is so much better than Financial Lives? So glad you enjoyed it! It's very good, yes, but I actually still like Financial Lives more. You're crazy. But I'm still glad you liked it. Have you seen the info on Walter's new book? It comes out in June, I think. Yep - Beautiful Ruins, June 12. Wow...this looks...really cool! Had no idea about this novel. Thanks, Greg. Finally someone else who read this book. Read it when it came out, loved it, but never found any friends who read and\or enjoyed it as well. This is also a good reminder to dig up The Financial Lives of Poets! Thanks! Yeah, I don't know too many people who have read this either - glad I did. Financial Lives is fantastic, too! Great synthesis of The Zero, Greg. I read it shortly after it was announced as a finalist for the NBA, and loved it. IMHO, it's still the best "9/11" book written. Another of his books, Citizen Vince, is great... it won the 2005 Edgar for best novel from the Mystery Writers of America, so different from The Zero, but equally clever and witty. I liked his last book, The Financial Lives of Poets, but not nearly as much as The Zero. He's got a new book coming out this Fall titled Beautiful Ruins that is getting great reviews. I was at a book reading featuring Pulitzer winner Richard Russo and NBA winner Pete Dexter, and an audience member asked Russo what the best book he'd read recently was, and he said Beautiful Ruins, and Dexter jumped in and called Jess Walter the most underrated writer in America! Thanks for the comment, Mike - love the anecdote about the Russo and Dexter signing. Beautiful Ruins is actually out in less than a month (June 12)- can't wait! 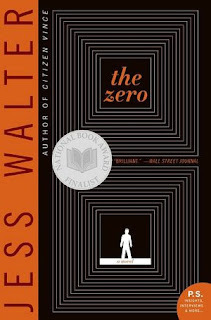 I loved Financial Lives of Poets and am looking forward to the author's newest book but don't think I can read The Zero. I was in NYC on 9/11 and still find it hard to read novels or see movies set around the event. This book was just too dark for my taste. I really didn't like it. I read it for my book club and I was supposed to be the facilitator for the discussion. That was difficult since I disliked the book, but we did have some good discussion about it once we all got together.